Deira Islands ... key water edge delivery deal for Van Oord. Van Oord of the Netherlands has been appointed by leading UAE developer Nakheel to deliver 23.5 km of coastline and breakwaters at Deira Islands, a new, 15.3-sq-km waterfront city in Dubai. 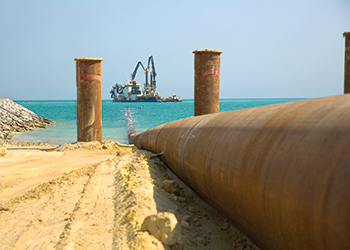 The project is one among a string of contracts that the leading marine engineering contractor has secured in the region over the past year, with others including the Suez Canal in Egypt and a key reclamation assignment in Kuwait. The two-year, Dh387-million ($105 million) contract signed by Van Oord Middle East’s Dubai Branch with Nakheel includes beaches, quay walls, rock edges and breakwaters at Deira Islands. 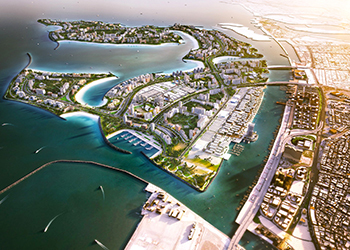 The contract is Stage One of Nakheel’s water edge delivery programme at Deira Islands and includes 8.5 km of beaches, 3.5 km of quay walls and 9.5 km of rock revetments at two of the four Deira Islands. The work includes a 4-km stretch of waterfront, big enough to accommodate more than 500 yachts and boats, at the 4.5-sq-km South Island. Van Oord, which will deploy two cutter suction dredgers, will also construct 2 km of breakwaters to protect the newly-created basin and beachfront. The development is set to transform the Deira district into a world-class hub for tourism, living, retail and entertainment. Deira Islands paves the way for hundreds of new hotels, serviced apartments, mixed-use buildings and marinas. Nakheel itself is developing a significant chunk of the South Island with a host of new attractions including Deira Islands Night Souk, Deira Mall, and Deira Islands Towers and Boulevard. Deira Islands itself was constructed by Van Oord between 2005 and 2008. Van Oord has been highly active in Dubai since 2001. The company had also been previously engaged by Nakheel for dredging and coastal work on its other world-renowned waterfront projects in Dubai, including The Palm Jumeirah and The World, which added 300 km to Dubai’s coastline. Deira Islands will add another 40 km, including 21 km of beachfront. Other projects undertaken by the company include the harbour development in Mina Zeyahi, the land reclamation for Dubai Maritime City, Jumana Island and Pearl Jumeirah for Meraas Development and the reclamation of various beaches. Van Oord, headquartered in Rotterdam, is a leading international contractor specialising in dredging, marine engineering and offshore projects (oil, gas and wind) with expertise ranging from design to execution. The independent family business employs about 5,000 professionals worldwide and has a modern fleet of more than a hundred vessels and other specialised equipment. The company secured two major projects in the Middle East last year, which contributed to making 2014 a record year when its turnover exceeded €2 billion ($2.23 billion) for the first time in its history. Van Oord ... engaged on KNPC’s reclamation contract. These include a land reclamation project for Kuwait National Petroleum Company (KNPC) in Kuwait and the dredging of a canal parallel to the Suez Canal in Egypt. ‘The Middle East has been very important to Van Oord for decades,” says CEO Pieter van Oord. Van Oord was awarded the land reclamation project for KNPC early last year. The $500-million contract involves the reclamation of land in a ‘sabkha area’ (a salt plain near the coast) for the construction of a new refinery in Al Zour, south of Kuwait City. The refinery will produce 615,000 barrels a day under a $23 billion investment programme. Work on the 30-month project involves dredging and reclaiming some 65 million cu m of sand and executing extensive ground improvement. It also includes constructing various channels, a basin for a future jetty, a barge dock and roads. Van Oord will deploy large trailing suction hopper dredgers and cutter suction dredgers. Meanwhile, on the Suez Canal project, Van Oord is working as part of a consortium that also includes Royal Boskalis Westminster of the Netherlands, National Marine Dredging Company (NMDC) of Abu Dhabi and Jan de Nul of Belgium. The total contract value amounts to $1.5 billion, with each partner entitled to an equal share of $375 million. The ‘new’ Suez Canal partially runs parallel to the current waterway and the project entails widening and deepening of the existing canal. The contract includes the construction of the parallel section of the canal with a length of approximately 50 km to allow ships to simultaneously transit in two directions as well as the widening and deepening of a number of existing sections to a depth of 24 m, says a spokesman for Van Oord. The majority of the dredging activities for the canal expansion will be executed with 17 cutter suction dredgers. The project is due for completion this month (August). Van Oord’s strategy continues to focus on its three current activities: dredging, offshore oil and gas, and offshore wind. “This strategy is aimed at both strengthening and investing in our position in our existing main activities. In addition to the investments in new vessels, the acquisitions of J T Mackley and Company (UK), the staff and equipment from Ballast Nedam Offshore, and all of the shares in Dravo (Spain) in 2014 fit right into this strategy,” says van Oord. According to Van Oord’s 2013-2018 Strategic Plan, the company will be investing more than $1.1 billion in building new vessels and modernising and replacing the fleet.